Happy St. Patrick’s Day! It was a very quiet St. Patrick’s Day around here. More of the same—exercising, rest, reading. The only green I saw today was in my window garden. 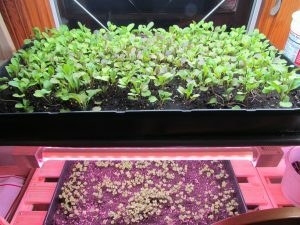 I have two generations of arugula growing, one planted three weeks ago and one planted one week ago. 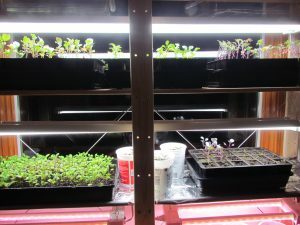 I’m experimenting to see how long it takes to get arugula to the ‘eating’ point when growing in the window garden. The other cool weather plants are almost ready to plant outdoors. Tomorrow I go to outpatient physical therapy for the first time. It will be interesting to see how that goes.